Welcome to Le Clos de Blisse! Ideally located close to the millennial city of Bayeux and only a few kilometers away from the American D-Day beaches, The Clos de Blisse offers the perfect base to discover the historical and cultural treasures of Normandy. Lodge Juno, Utah and Omaha Mansion House Are The three guesthouses disponible dans le 8-hectare property. With no vis-à-vis contents, each benefit from icts own private garden and terrace. All are state-of-the-art renovations of 18th century buildings dating back from the French Revolution. Whilst Retaining Many original features, They Provide The Highest modern comfort (underfloor heating, wifi, apple tv). Overlooking the water and the surrounding Norman countryside, the swimming pool and sauna will make your most relaxing stay. A beautiful property with charming hostess. A perfect place to take a peaceful holiday. Fantastic amenities within the grounds and perfectly situated to explore Normandy. Would highly recommend . Tony and Sara Kent. 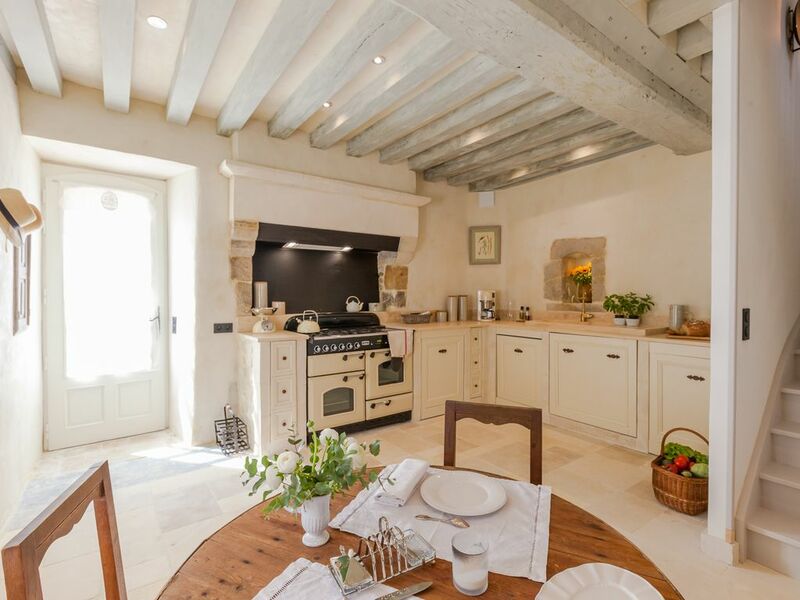 Clos de Blisse is Exceptional - Don't Miss the Chance to Stay Here! My husband and I had the great fortune to stay at this grand estate (in the Juno Lodge) for three nights in May, 2018. If you are looking for history, tranquility and romance in accommodations with all the modern day amenities, this is the place. The accommodations are spotlessly clean and fresh and the grounds are manicured and breathtakingly beautiful. Although we stayed in the Juno Lodge, the owner, Ms. Samuelle Carlson, kindly offered to show us the Omaha Mansion, which was just as lovely only on a much grander scale. The Omaha Lodge and Utah House are perfect for families or friends who want to gather together and enjoy the beauty of the estate and surrounding area. The Juno Lodge is a romantic cottage made for two people who want a quiet and cozy retreat after a day of exploring. Clos de Blisse is perfectly located in the countryside; 20 minutes from the Omaha Beach, 25 minutes from Bayeux and 1 hour and 20 minutes from Mont Saint Michel. Not only are the surroundings and accommodations truly special, but Ms. Carlson is a kind and gracious host who went out of her way to make our stay memorable. She is responsive, knowledgeable and extremely helpful. I highly recommend Clos de Blisse. My review doesn't do it justice so I encourage you to come experience this special place for yourself! Our stayed at the Juno Lodge exceeded our expectations! Samuelle was a wonderful hostess and gave us a tour of the grounds when we arrived. We immediately felt comfortable and relaxed! She has thought of every detail to make sure guests feel at home and enjoy their stay. The location is an easy and short 25 minute drive to Omaha, Pont du Hoc, and Utah beaches. Samuelle even provided the ocean tide schedule to us so that we could arrive at the beaches during low tide. She thinks of it all and we truly enjoyed our stay! We celebrated our son’s 40th birthday for a week at Clos de Blisse. I would give it 6 Stars if that was an option. This is not an ordinary gite! Samuelle’s restoration of these three beautiful buildings was meticulous and tasteful. We rented all three houses which was perfect for our family of 12. My husband and I stayed in Juno right on the picturesque little pond. We loved being separate but part of all the activities. We all had breakfasts in our separate houses and dinner in the spacious dining room at Omaha house. The children loved feeding the ducks and fishing in the stocked pond at Juno with cocktails and cartwheels on the lawn every evening. Samuelle was so charming and helpful in planning our week. She responded to all our questions and needs quickly. Her suggestions for activities and restaurants were fabulous. She booked a wonderful chef for us for two nights and a caterer for three others. She had fresh croissants delivered to our door daily. We were so close to all the important historical sites, Bayeux and other charming villages. Mont St. Michel was a little under 2 hours drive. My only regret is that we did not stay two weeks. Thank you Samuelle for a vacation we will never forget!